Welcome back to another prep day lesson! Last week we started the hands-on food part of this series with a leafy green discussion. 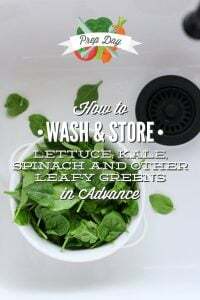 Did you prep any leafy greens last week using my simple storage method? I hope you found the method and act of prepping food in advance to be incredibly helpful. Now it’s time to turn our focus from produce (we will revisit vegetables and fruit later on) and talk about chicken! One of my favorite foods to prep in advance is shredded chicken. Cooking a whole chicken and then shredding the meat in advance helps me save money and quickly prepare meals throughout the week. The act of cooking meat takes time (defrosting, cooking, cutting/shredding); a valuable commodity that’s often limited on busy weekdays. Thankfully, there are ways to prep meat advance without spending hours in the kitchen. 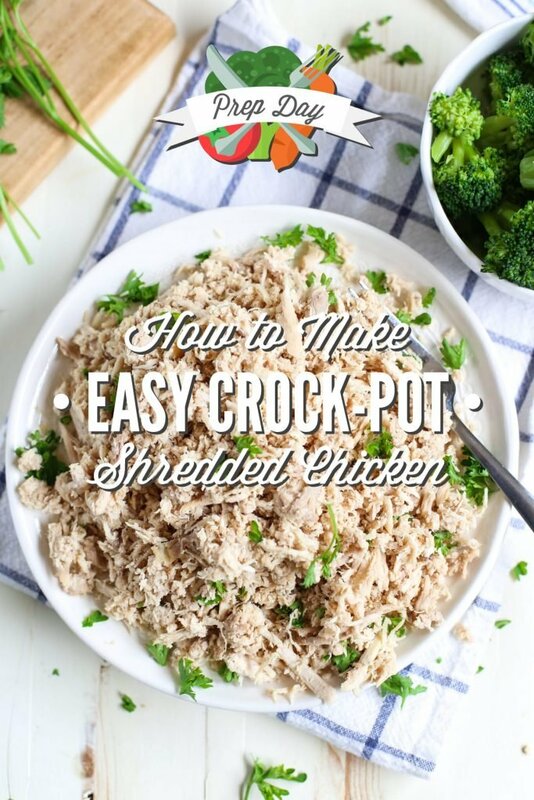 Let’s talk about my favorite method for prepping shredded chicken in advance: the crock-pot! 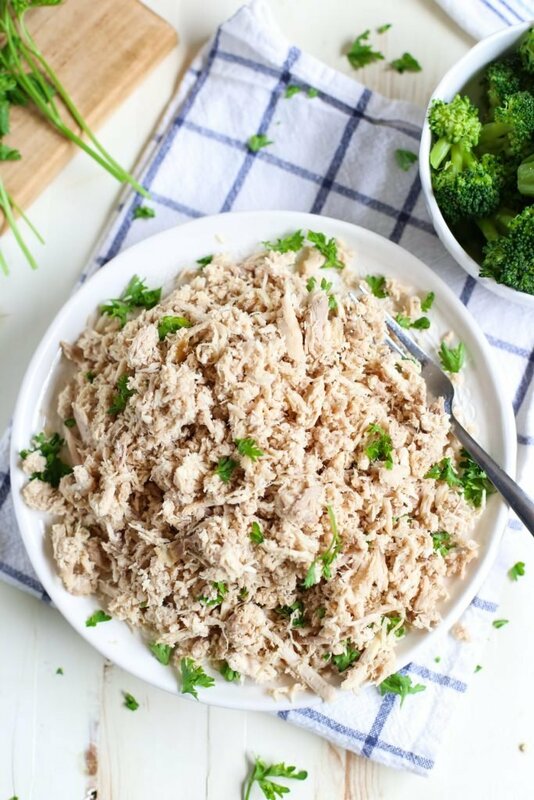 Before I share my crock-pot method, let’s focus on the main reasons why you should think about making shredded chicken during your prep time. After all, if you’re going to include a task on your prep day printable or mental plan, it must help maximize your time throughout the week (AKA: it better be important!). A whole chicken is always a money-saving investment. While a whole pastured chicken (from chickens able to roam the land and eat bugs) may appear to be more expensive than a couple of breasts, in the end a whole chicken will yield twice as much meat. 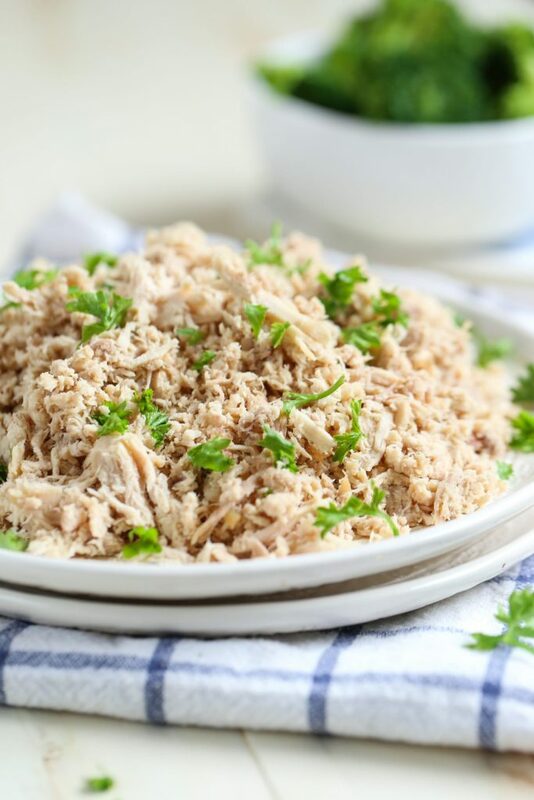 Shredded chicken is great to use for lunchmeat. Instead of purchasing sliced deli chicken at $9 per pound, cook a whole chicken in the crock-pot and shred the meat. The shredded meat may be used to make multiple sandwiches, dinners, salads and casseroles throughout the week for a fraction of the cost. I realize making your own lunchmeat sounds time consuming, but it’s not! 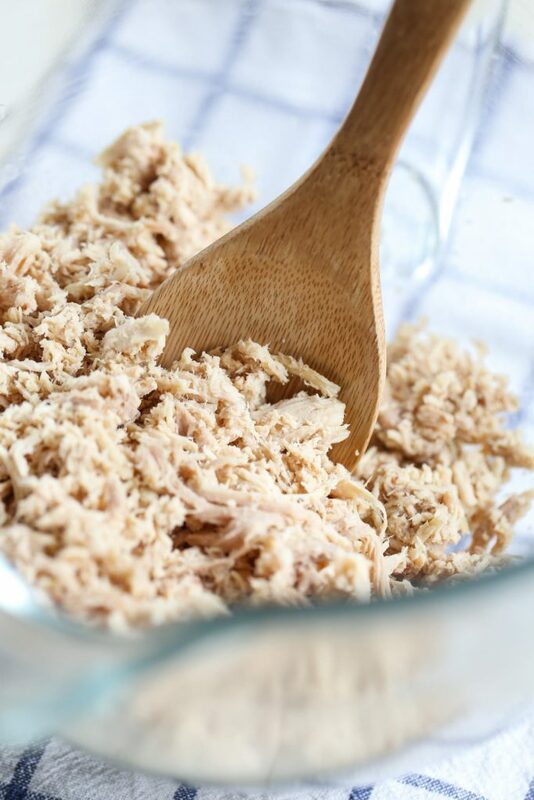 Today I’ll show you exactly how to prepare lunchmeat (AKA: shredded chicken) in advance with very little hands-on time. Note: I still purchase lunchmeat on occasion (particularly Applegate or Whole Foods’ house-made lunchmeat). I save this expense for special occasions. Chicken will last for 4-5 days in the fridge, which makes it the perfect meat to cook and shred in advance for quick and easy meals. 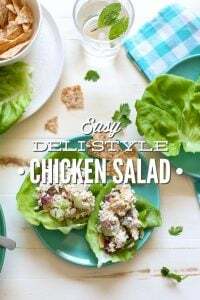 My go-to meals using home-cooked shredded chicken include: Chicken and Rice, 30-Minute Chicken and Black Bean Nachos, Deli-Style Chicken Salad, Probiotic Chicken Caesar Salad (use the shredded chicken instead of the chicken thighs), tacos, quesadillas, Creamy Chicken Quinoa and Broccoli Casserole (I use the shredded chicken instead of cooking the breasts in the casserole), Mac, Chicken and Cheese Bites, and soups and easy salads. While I love roasting a whole chicken, the roasting method requires extra prep and cooking time. 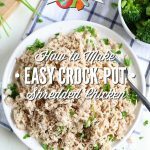 So when it comes to prepping shredded chicken in advance, I take a super easy approach using the crock-pot. The crock-pot requires zero baby-sitting, unlike the oven, and produces moist chicken meat every single time. No baby-sitting? Very little hands-on time? Super moist chicken? OH YEAH! Sign me up. Once the chicken meat has been removed from the crock-pot, simply fill the base with water and a few vegetables. Water + vegetables + chicken bones = AMAZING HOMEMADE BROTH! Turn the crock-pot on and walk away. That’s it! 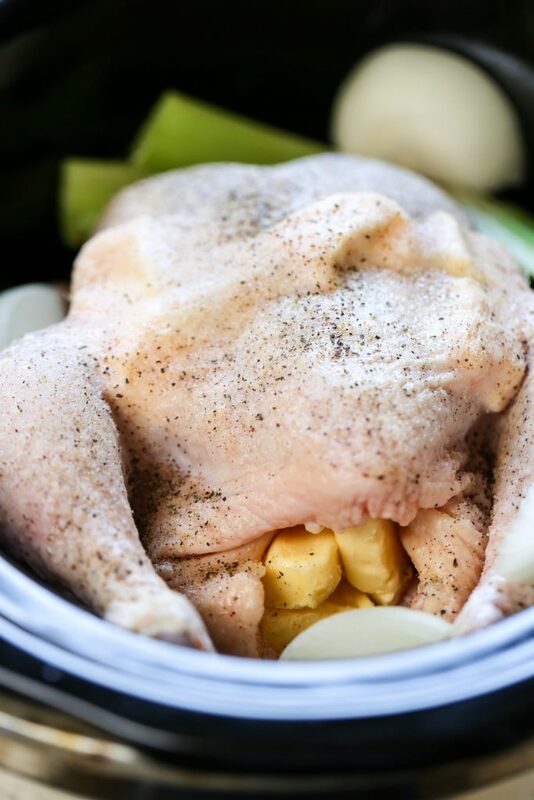 By spending a few minutes of prep time cooking a whole chicken in the crock-pot, you can make shredded meat to use throughout the week and nearly a dozen cups of homemade chicken broth. Now that’s a prep time win! One of my favorite foods to prep in advance is shredded chicken. Cooking a whole chicken and then shredding the meat in advance helps me save money and quickly prepare meals throughout the week. In the base of a crock-pot, place the whole chicken. Place the butter cubes inside the chicken and between the chicken skin and meat near the breasts. The butter will keep the chicken moist and tender. Stuff the chicken cavity (the inside) with the onion and celery stalks. Note: Place the onion and celery stalks around the outside of the chicken if they don't fit inside the cavity. Cook the chicken on high for 4-5 hours in the crock-pot, until the chicken is tender and falling off the bone. Freezing cooked meat is the perfect way to “cook once, eat twice.” Freeze half the shredded chicken for future homemade convenience meals. Frozen, cooked meat usually lasts about 3 months in the freezer. 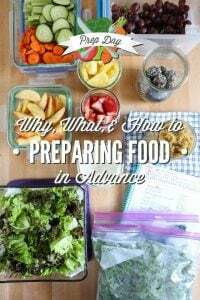 This week, your homework is to create a meal plan, go shopping for the food you’ll need to implement the meal plan, set aside a specific day/time for prep time, and then print and fill out thePrep Day Action Plan printable. 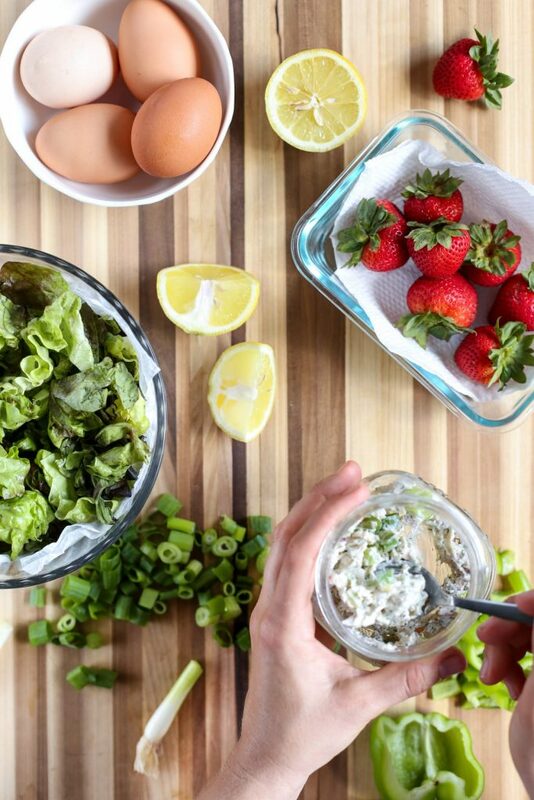 Focus on five foods you can prep this week based on your meal plan and schedule: washing and storing greens, cooking and shredding chicken, making rice, baking muffins, etc. Next week we’ll work on a new prep day activity. We’re going from chicken to baked goods. Yum! I just made this. I think you forgot to list water as one of the ingredients. Hey Grace, Awesome! I’m so glad you like it. No water is needed when you use a whole chicken and butter in the crockpot :). There should be a lot of juices at the bottom of the crock-pot by the time the chicken is done cooking. Sometimes I pour the juice over the shredded chicken for extra flavor. I wanted to make this for chicken enchiladas, can I just add the enchilada sauce to the crock pot for the duration of the cook time? Hey Kristina, I would remove the shredded and cooked chicken from the crock-pot to a separate bowl, and then mix in the enchilada sauce. Am trying this method for the first time. Are you supposed to leave the skin on when you shred it? Hey Veronika, That’s up to you, but I like to leave the skin on. The skin adds so much great flavor to the chicken. Hi, made this yesterday and now I’m straining the broth. How do you store/freeze the broth? 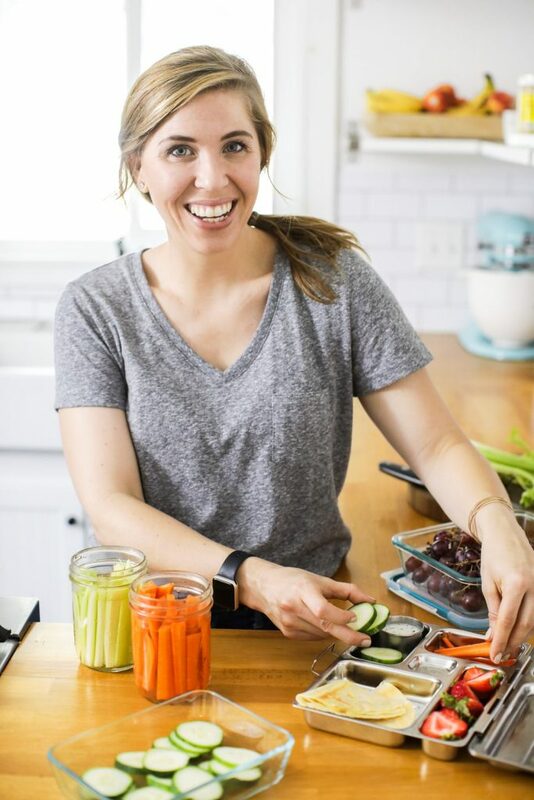 Hey Susan, I freeze homemade broth in freezer-safe mason jars (they are wide-mouth and usually say “freezer safe” on the package), ziploc baggies, or ice cube trays (then dump the “ice cubes” in a bag). If I’m going to use the broth within a week, I keep it in the fridge. So, I have a question. I just cooked my first whole chicken ever, and first time in the crock pot. I know you use the bones to make broth, but what do you do with the leftover juices from cooking the chicken? Any advice you can give would be great, I’m really new to cooking in general. Hey Rachel, Congrats, that’s awesome! I generally just leave the juices in the crock-pot (or transfer them to the crock-pot) along with the bones for making broth. Sometimes, I’ll save the juice and add it to rice later in the week, or use it to saute veggies. I am fixin to make the chicken tomorrow and it’s just before payday so funds are short. I don’t have any onions or celery but i have lots of spices, can I use onion powder or celery salt in place of the fresh onions and celery? I am new to cooking as well. Thank you for your time. Hey Jennifer, Yep, you can use any spices. I suggest mixing them in a small bowl first and then rubbing them over the chicken. I’d probably go easy on the celery salt, or use it in place of regular salt. You can also skip the spices, and the chicken will still be delicious :). At what setting and for how long do you use on the crock pot for the broth? Hey Kara, I use the high setting for about 12 hours. I’m slow-cooking a citrus-brined and then citrus-marinated, whole bird today. Enchiladas are on the menu for tomorrow! I always prefer to make my own stock, so this helped. Why I’ve never thought to keep it in the crockpot before is beyond me…. This is excellent info – thanks Kristin! I plan to do this in the next week or two. I often make my own broth anyway, and this is a great way to accomplish two things at once. Thank you, TC! I think you’ll love this method! Hi Kristin! I made this chicken for the first time yesterday – so easy, tender, and flavorful! My only question is this: how do you remove alllllllll the tiny bones (ribs, vertebrae, etc.)? We have a toddler, so I very carefully worked through all the meat to remove the bones and it was super time consuming. Also, because the meat was so tender, it ended up being more like ground chicken instead of shredded since I handled it so much. Any advice? I made spatchcock chicken last week and it was so easy and delicious! Our butcher even “spatchcocked” it for me – although, he did look at me like I was crazy when I asked, haha! Thanks for sharing this method/recipe!